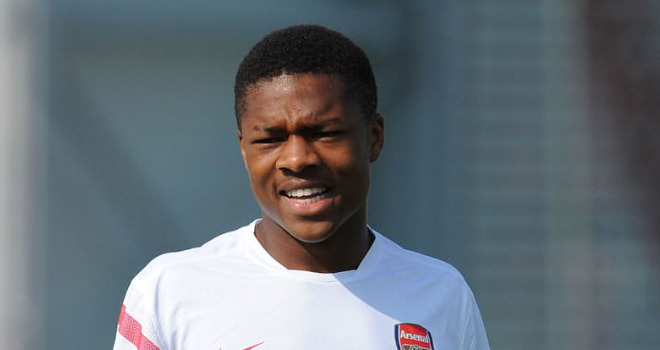 Chuba Akpom scored Arsenal’s opener but was unable to build on that early lead. Arsenal Under 18s saw their FA Youth Cup dreams shattered as a result of a crazy 11 minute period against Everton last night. Chuba Akpom gave the Gunners an early lead when he converted Anthony Jeffries cross before Matt Pennington levelled the scores moments later with a well-placed header. Arsenal lost the game at the start of the second half when the away side scored three times in quick succession thanks to some abysmal Arsenal defending. Firstly, Zach Fagan’s scuffed cross landed at the feet of Chris Long, who easily netted. The lead was 3-1 minutes later when another Fagan mistake meant the ball landed at the feet of Conor Grant to extent Everton’s lead. Harry Charsley ended the manic minutes for Arsenal with Everton’s fourth, putting the game beyond the Gunners. Serge Gnabry’s goal proved a mere consolation for the London club as they exited in embarrassing fashion, unable to recover from three goals they conceded so sloppily at the start of the second half.